This weekend saw the 74th anniversary of the closure of Auschwitz, and many clubs paid tribute to those who lost their lives during those terrible atrocities. Whilst there was no official campaign from the DFB, many sides chose to keep the memories of those events alive, with several banners imploring society to never forget what happened so that lessons can be learnt. This is the German way, facing up to their history and their horrific mistakes made. On the pitch, this was a weekend of few surprises. Borussia Dortmund and Bayern Munich continued their winning runs, beating Hannover and Stuttgart respectively. Borussia Mönchengladbach and RB Leipzig were also victorious, whilst all of the bottom four lost. There were plenty of goals, however, despite most games going to form. 37, to be exact. As ever, the Bundesliga is the best place for penalty-area action. We discuss all of the weekend’s games before moving on to our In Depth section. There has been an influx of United States players in the Bundesliga in recent years. And this transfer window also saw a record fee for an American, with Christian Pulisic swapping Dortmund for Chelsea for the sum of €64 million. With all this in mind, we decided to look at why so many American footballers come to Germany. We also remember some of the more famous and successful names from across the pond. As always, a very special thanks to our friends ‘Phre The Eon’ for the theme music. Anyone interested can find them on Facebook. 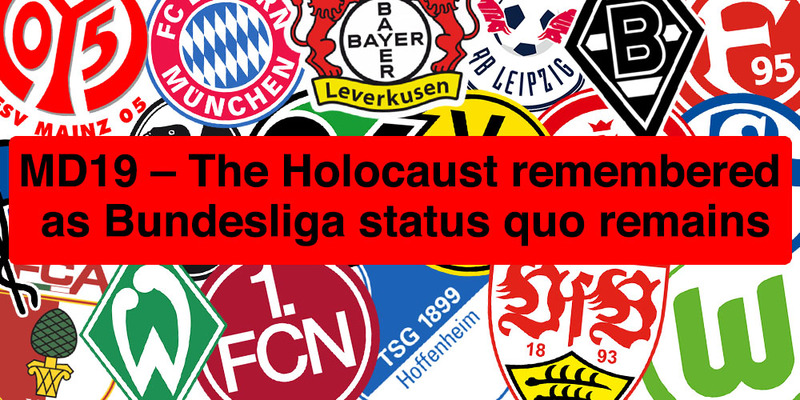 As mentioned on the podcast, 11Freunde put together a PDF document in regards to Jewish footballers who were victims of the Holocaust. If your German is up to it, you can ready through it here. MD18 - Dortmund stay calm under Bayern pressure as the Bundesliga returns!